Some players have a knack. LaGrange High junior forward John McDonald is one of those soccer players with a magnificent shot. McDonald is gifted. He can get rid of a defender like a pair of dirty socks. McDonald did that again on Thursday night as he rushed the goal box for three scores in LaGrange High’s 6-0 rout against the Columbus Brookstone boys at Callaway Stadium. “We are getting more technical. Our chemistry is good, and we’re very organized,” said McDonald. He scored the second goal of the first half at the 32:02 mark with an assist from Granger senior Robert Reese. McDonald would also zero in on a pair of goals in the second half. He tacked on a couple of 10-yard goals. The La-Grange High lead ballooned to 4-0. Reese, the senior striker, also scored earlier in the soccer match with the first goal of the game. The 6-foot-1 Reese dribbled through for a three-yard score with 37 minutes to go in the first half. He and the Grangers made it look easy. The Grangers were dishing, darting and scoring in a variety of ways. They were running the show. “We’re possession-oriented. Everybody gets their shot. We play for each other. 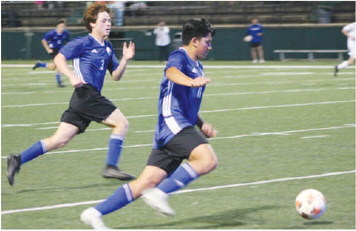 We have fast players, and everybody does his job,” said Shane Pulliam, the head soccer coach of the 10-2-2 Grangers. 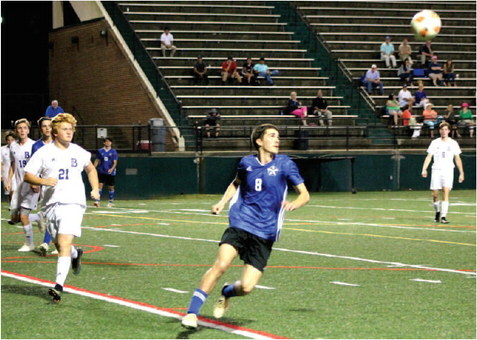 This boys game was not complete either without two more goals from La-Grange High School. The Grangers put some whipped cream on their win with second half scores from junior midfielder Logan Lopez and junior striker Josue Recinos. LaGrange High was beaming and boasting, but not coasting with a 6-0 lead. “LaGrange is a very talented team, and they spread us out. 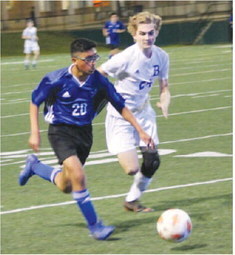 You have to stay focused against them,” said Brookstone soccer coach Michael Huwe (9-3-1). LaGrange High forward John McDonald (8) uses his head in the Grangers 6-0 win over the Brookstone boys on Thursday night. Granger sophomore Jason Recinos (20) sets the pace, and it was fast in a boys soccer match against the Brookstone Cougars on Thursday evening. Team speed is one of the LaGrange High soccer strengths. The Grangers showed that off on Thursday night against Columbus Brookstone.